Who is the Queen of Rap? 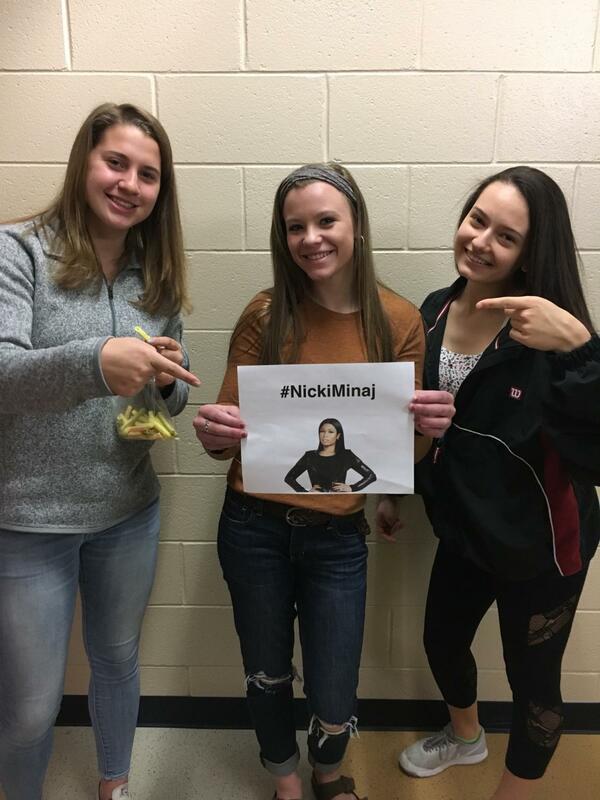 Pointing at their favorite female rapper, juniors Alaina McKnight, Madisyn Guiseppi, and Ariana Gonzalez are big fans of Nicki Minaj and listen to her music whenever they get the chance. Within the last year, Nicki Minaj and Cardi B have been in a fight for the title of best female rapper. Before 2017, people would have said with no doubt that Nicki Minaj is the best female rapper. Today, people would argue that Cardi B has surpassed Nicki Minaj. Based off the Billboard Hot 100 Chart History, Cardi B has had four songs that were in the top 10 and one song that was number 1 in her career. Nicki Minaj has had fifteen songs that were in the top 10, but never has had a song peak at number 1. Although Nicki Minaj has never had a number 1 song, eighty-four of her songs were in the Billboard Top 100. Cardi B has only six songs that made the Billboard Top 100. In recent times, Spotify would suggest that Cardi B is a better rapper than Nicki Minaj. Cardi B has 25,809,869 monthly listeners and is ranked 33rd in the world. Nicki Minaj has only 23,538,389 monthly listeners and is ranked 47th in the world. From the beginning of 2017 to now, Cardi B was clearly more successful than Nicki Minaj. Cardi B’s net worth was around $600,000 at the start of September, but after the release of the song “Bodak Yellow,” her net worth raised to around $4 million. Songs like “Bodak Yellow” and “Bartier Cardi” were able to be heard almost anywhere. All six of Cardi B’s songs that made the Billboard Top 100 Chart were either in 2017 or 2018. Cardi B is the second female rapper to ever have a song reach number 1. The only other female rapper to have a number 1 song is Lauryn Hill with her song “Doo Wop (That Thing)” in 1998. Cardi B was a nominee for “Favorite Breakout Artist” in the 2018 Kids’ Choice Awards. Also, Cardi B recently won the iHeartRadio Music Award for “Best New Artist.” In total, Cardi B has been nominated for 21 awards and won 8 awards. 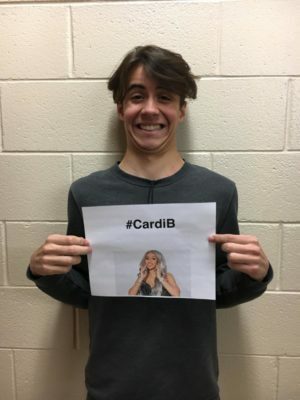 Junior Quinn Casheros smiles at the sight of his favorite female rapper, Cardi B. Cardi B is Quinn’s role model. Although Cardi B’s music is more popular right now, Nicki Minaj is still the best-selling female rapper of all time. Her net worth is an estimated $75 million. Some of Nicki Minaj’s accomplishments include the first solo female rapper to preform at the Grammy Awards, a full-time judge on the show American Idol, and the voice behind various characters in movies like Ice Age: Continental Drift and The Cleveland Show. For top rap albums on Billboard, Nicki Minaj has had three of her albums in the top 10 and three of her albums peaked to number 1. The last album Nicki Minaj produced, called “The Pinkprint,” was in 2014. Some of her recent well known songs include “The Way Life Goes” and “Bang Bang.” Nicki Minaj has been nominated for a total 402 awards and won 197 awards. This includes 4 Billboard Music Awards, 11 BET Awards, and 6 American Music Awards. Overall, both Nicki Minaj and Cardi B are clearly successful artists. Both of these rappers have set new standards for all of the rapping community. However, the question still is not answered. Who is the best female rapper? I think they both can be the queens of rap why is that so hard.